Pizza and beer. Pretty much two of my favorite things, especially together. I’ve been a fan of Wazee Supper Club‘s pizza for years. And thanks to their 2012 remodel, they now have an impressive 32 beers on tap. I stopped in after work recently with a couple friends to check out their selection. We went on a Friday, which happens to be Bacon Happy Hour at Wazee Supper Club. Every Friday from 4-5 in their bar area, they serve up free bacon. And you never know just what kind of bacon you’ll get; last Friday it was chocolate-covered. Since one friend and I don’t eat meat we passed on the bacon, but my other friend seemed to enjoy it. And though I don’t eat it, I do like the idea of offering a different style of bacon each week. It keeps things interesting. Upon looking over the tap list I saw a couple beers I was curious about, along with many of my standard favorites, so I went with a flight. One hoppy beer I liked a lot was Mad River‘s Steelhead Double IPA. And of course Ska‘s Modus Hoperandi (Favorite. Beer. Ever.) and Firestone Walker’s Double Jack IPA. Deliciousness. I also tried something unlike anything I normally drink: Duchesse de Bourgogne by Brewery Verhaeghe in Vichte, West Flanders, Belgium. This beer–described as a Flanders red ale–is considered a sour but also has a bit of sweetness to it. Sour beers haven’t quite grown on me yet, but I’m trying. So it’s nice to get tasters and sample lots of them because I’ve noticed that nearly ever sour I’ve had is very different from the next. My friends and I were just chatting over happy hour beers that evening, but I will visit again soon for some of their wonderful pizza. My favorite is the Bianca (garlic and olive oil base, mozzarella, fresh herbs) with green olives. Mmm…I’m getting hungry now. The next time you get a craving for pizza and beer, head on over and try Wazee Supper Club. 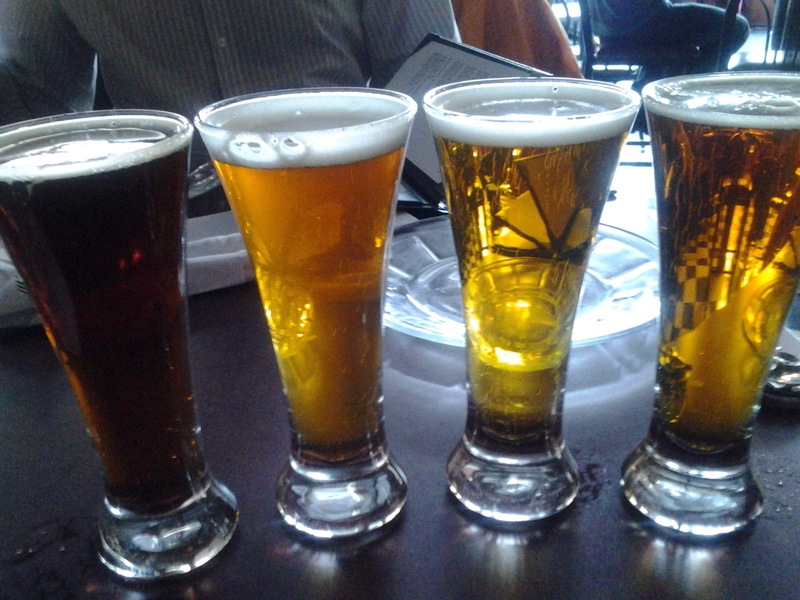 With 32 draft beers from which to choose, you’re sure to find something you will love!